Vanessa Leslie-Gomez had trained dogs at a rescue when she lived on Cape Cod, but then she moved inland and decided she needed to adopt a best friend for herself. 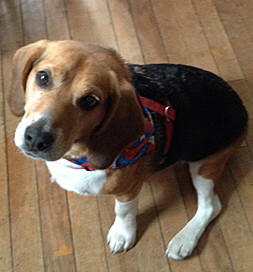 A Beagle listed on Petfinder caught Vanessa Leslie-Gomez’s eye. Buddy is decked out in his red, white and blue to visit the Veteran’s Hospital. Buddy had been adopted once but was returned because he hadn’t gotten along with another dog in the household. Vanessa’s application was waiting, so the shelter called her, and she hurried to the shelter to meet him. “I got there, and it was love at first sight,” she says. “He jumped into my arms.” That made the decision to adopt him simple. She started training Buddy to be a therapy dog, and now the two of them visit the Veteran’s Administration Hospital, where Buddy works his magic with the veterans he meets. One of the veterans once had a Beagle, so he quite naturally fell in love with Buddy and asked if he could buy him some cookies. Vanessa said he could. “Now Buddy sees Jack and won’t move until Jack gives him a pet and some treats,” she says. Training Buddy was a lot of work, she admits, but she’s very proud of him, as she should be of her own efforts to bring some sunshine into the live of the veterans they visit. They’re a team, after all.